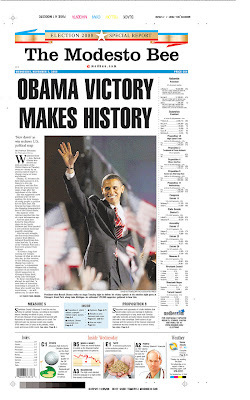 Maybe I just don't remember -- did newspapers sell stuff like this after Bush won in 2000 and 2004? The Lexington Herald-Leader is doing the exact same thing. So is the Charlotte Observer. Hey, why not? Revenue is good. Regardless of your politics this was an historic election. Bush's elections in '00 and '04 didn't trigger massive single copy sales either. Besides, if you are still smarting because McCain lost you can take solace in rolling your mouse over the president-elect. The Star-Telegram is too. To be fair, though, Bush's election doesn't have nearly the historical significance as Obama's - whether you agree with the decision or not. Yep, thats right. First Marxist President. Personally, I am betting on the historical significance of the way he leaves office. I won't buy anything from McClatchy though. They won't be in business. 11:41 Get over it. Don't collect you pay check either. I'll buy a front page of my paper on Jan 21 that shows George Bush getting on a plane for Texas....now that's something worth collecting!